Cisco Adaptive Security Appliance (ASA) is quite a versatile device integrating application-aware firewall, SSL and IPsec VPN, intrusion prevention system (IPS), antivirus, antispam, antiphishing, and web filtering services. Cisco ASA also supports routing protocols such as Routing Information Protocol (RIP), Enhanced Interior Gateway Routing Protocol (EIGRP), and last but not least, Open Shortest Path First (OSPF). 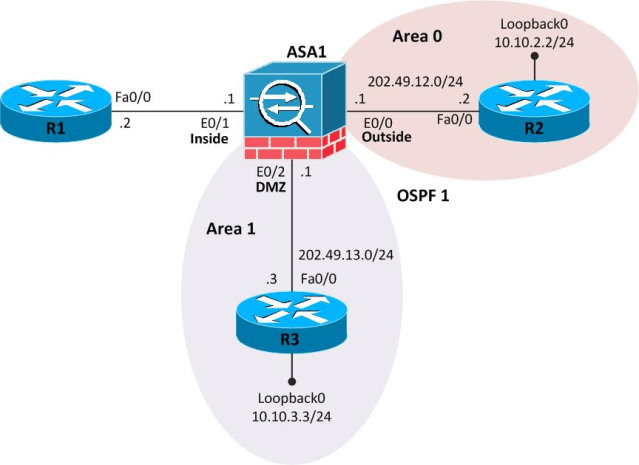 In this tutorial, our focus will be OSPF configuration on Cisco ASA according to the figure below. Please note that configuration on R1 is not relevant to this scenario and R1 is just shown for the sake of completeness. We will start by configuring OSPF on routers R2 and R3. We would also configure MD5 authentication for OSPF on Fa0/0 of R2 and R3, using cisco as the authentication key. Let’s now move to the interesting part where we will configure Cisco ASA. We will first configure interface IP addresses, at the same time assigning Ethernet0/0, Ethernet0/1, and Ethernet 0/2 to outside, inside, and DMZ (de-militarized zone) zones, respectively. Inside and outside interfaces are assigned default security levels of 100 and 0 automatically. The higher the security level, the more secure an interface is. Therefore, the most secured network is placed behind an interface with a security level of 100, whereas the least secured network is placed behind an interface with a security level of 0. A DMZ interface can be assigned a security level between 0 and 100. We assigned a security level of 50 to the DMZ interface using the security-level command. We will also configure MD5 authentication for OSPF on the outside and DMZ interfaces choosing cisco as the authentication key. Towards the end of configuration given below, both outside and DMZ interfaces are assigned to the appropriate OSPF area using the network command. Let’s now verify that ASA1 has indeed established OSPF adjacency with R2 and R3 using show ospf neighbor command. The above output indicates that OSPF neighbor relationships have been successfully established with both R2 and R3. You can use show ospf interface command to find out more details such as OSPF neighbor authentication status. You can also use show ip ospf interface brief and show ip ospf neighbor commands on R2 and/or R3. We are showing the output of these two commands for R2 here. We can expect that R2, R3, and ASA1 may also have learned some OSPF routes by now. Let’s verify that by using show ip route command on R2 first. Please feel free at this point to use show ip route command on R3 as well. We can use show route command on ASA1 to find out which routes it has learned over OSPF. Though OSPF routing is looking good at this stage, we may not yet be able to ping from R2 to R3 or vice versa. On Cisco ASA, you do not need to define an ACL to permit traffic from a high security level interface to a low security level interface by default. However, an ACL must explicitly permit traffic from a low security level interface (such as outside with security level 0) to a high security level interface (such as DMZ with security level 50). Here is how we configure an ACL and apply it inbound to the outside interface to allow incoming traffic. Just for example purposes, we will allow icmp traffic from outside to IP 10.10.3.3 in DMZ. Let’s try to ping from R2 to Loopback0 on R3 and vice versa, in order to seal the deal. Thanks for this lab !!! Good for ASA beginners !! !